Square Smash, published by Yoero, is a simple block-busting game available for free for Android devices. The idea is simple enough: red, white, blue and green blocks form at the bottom of the screen, adding to the blocks already on the board. The object of the game is to avoid letting any of the blocks go off the top of the board by clearing groups of three or more blocks of the same color (blocks that touch diagonally don’t count). The game has 3 speeds: slow, normal, and of course, fast. The slow is nearly too easy, the medium isn’t much better, but the fast is much more of a challenge. 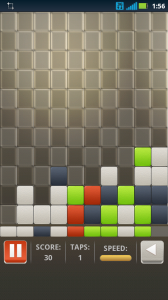 The lack of variety of color in the blocks and the repetitive music tend to make the game dull kind of quickly. On the other hand, to spice up the game, the player has the option of playing in “100 Taps” mode, where object is to, as the name suggests, get the highest score possible while only tapping 100 times. Of course, accidental taps count towards this total as well, so it isn’t beneficial to go on a tapping frenzy in order to keep your blocks from touching the top when in this mode. 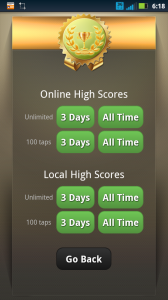 If, after a labor intensive session of square smashing, you feel like seeing how you stack up (pun intended) against your own previous scores and those of other players, from either the past 3 days or of all time, there is a menu option to do just that. While Square Smash is by no means highly original or intuitive, the simple nature of the game does make it highly addictive and enjoyable, and for the wonderful price of free, it’s pretty hard to go wrong. 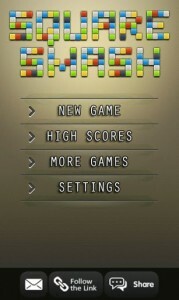 Square Smash is free from the Google Play store and can be downloaded on any Android device with Android 2.0 or greater.